Please help me formulate my sentences/thoughts here into logical jargon and solve Case 2 below. | F | T |  T   | This really baffles me. Who said so? | F | F |  T   | This baffles me less. Background to this question: I was asked to show the difference between The Quine–Mccluskey Algorithm / The Method Of Prime Implicants and a Truth Table. Also, I was tasked with testing the properties of satisfiability and tautology. p and q represent atomic formulas (because this is propositional logic, they represent then propositional variables/sentential variables), therefore they can only be assigned single values i.e. TRUE or FALSE. I understand this, so this part may or may not be relevant. I could include it here for completeness upone request. Answer to the first version of the question. Because, see the truth table for →, a conditional with false antecedent is always true. I assume that you are evaluating the truth value of the formula: (p→q) → (q→p). In this case, the formula is evaluated to: (F→q) → (q→F). We have that (F→q) is T, for q whatever (conditional with false antecedent). We may check that (q→F) is equivalent to ¬q (again: check with a truth table). 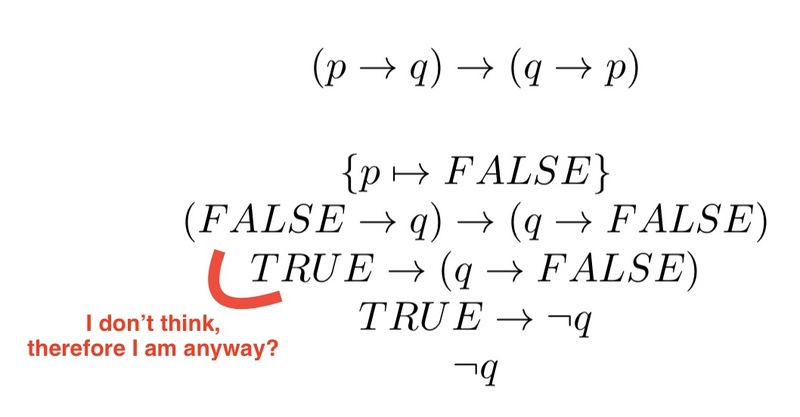 In conclusion, we have that the original formula, when p is FALSE, is equivalent to: T → ¬q. We use truth table again to check that this in turn is equivalent to ¬q: when q is TRUE, we have that T → ¬q is T → F, i.e. F, and when q is FALSE, T → ¬q is T → T, i.e. T.
For a possible justification of the truth table for the conditional, we can use the classical equivalence of A → B and ¬(A ∧ ¬B), that translate the reading of the conditional as: "B is a necessary condition for A". If ¬(A ∧ ¬B) is TRUE, then either A is FALSE or ¬B is FALSE. Thus, a conditional A → B has the value TRUE either when A has the value FALSE or B has the value TRUE, otherwise A → B has the value FALSE. Classical propositional logic (or boolean logic) is truth-functional in the sense that the meaning of a formula is its truth value. This is shown by the fact that proposiational letters: p, q, ... are interpreted always assigning them truth values: T and F.
This implies that the "meaning" of the connectives are exactly what is defined by their respective truth tables. Because the truth table says so. Propositional logic is formal in the sense that you are expressing propositions with propositional variables. The connector makes the argument a conditional form or formally "a material implication". For deduction to work 100% our formal method must account for all instances of conditional arguments. So validity expresses the connection between the conclusion with the premises in the event that if there is a single instance of a false conclusion something is wrong with at least one or both premises. Let me give an example, let C= I have cancer in the liver and prostate. Let D = I will die within 90 days. The formalization would be C --> D. Now it is not true that I have any cancer to my knowledge. Thus the antecedent is false. In this example the consequent is not effected by the antecedent. All conditionals do not have a necessary relationship as this case shows. I can still die within 90 days from other causes besides cancer. Cancer is not the only way I can die: I can have a heart attack, get hit by a bus, get shot in the forehead 15 times, fall out of a 3 story building, etc. basically what this argument form expresses is that one can still get to the goal or conclusion with or without the antecedent. Some conditionals are necessary where the relationship is so tight one variable condition will effect the other. This is not always though. If the Yankees win game 7 then the Earth is the third planet from the Sun. Well the Yankees lost game 7. Our planet is safe from losing its place to the Sun because the Yankees lost. Formal logic would lose all credibility if cases like these were not covered under the rules. We would have a logic system where sometimes we get the answer correct and sometimes we would get it wrong. An outsider would ask "how do you know you have it correct now?" I am pretty confident in a real world situation like court setting a witness sometimes giving incorrect answer will not sway a jury in his favor always. In business if I propose to a company if you give me $100,000 to invest for you in stock x, it will make millions "some of the time" I will not be taken seriously. The formal rules help or assists in not making mistakes where the conclusion is definitely wrong and we have nothing to show for it. It boils down to "because the truth value says so". Or more precisely, "because that is how we have defined implication". But as often is the case in mathematics and logic the definitions are made in order to create systems that are convenient to work with. For implication we want to retain a binary system, ie. we do not want to introduce a third thruth value. We could, for example we could introduce a third truth value "vacous", but that leaves us with needing to redefine all the connectives. For example what should the truth value of "true implies vacous" be? So we want false implies true to be either true or false. If we define it to be false then we create a problem. Consider the statement if a number is even then its an integer. Most people would agree that this is true. A special case of this statement is "if 3 is even then 3 is an integer". Ie. a case of "false implies true", which we wanted to define as false. Meaning that if we define "false implies true" to be false, we would need to reject the statement "If a number is even then it's an integer." This is caused by material implication. Wikipedia has a site dedicated to this topic. It can be found here: https://en.wikipedia.org/wiki/Material_implication_(rule_of_inference). So you want to think of F → T. If you want a binary logic, you only have two options: T of F. Suppose that it's T. This would mean that in your logic any implication of that form would be true. So now you could take any statement Q, for instance, "Martin is the smartest person in the world", and you could take P to be "the sky is green", and now your logic system implies that "Martin is the smartest person in the world" is true (I like that system!). To avoid the above, the only possibility is to take F → T to be false. For the F → F implication, it is reasonable to accept that an implication is equivalent to its contrapositive, which will be T → T; and you you seem to accept that T → T should be true.